There are instructions in the packet with it of course and as soon as you have read them, you can change the pages from blank to black and white and then to colour as many times as you like. "It is also a very good price! They are £7.95 on my magic website." There is a £1.50 post and package fee, so the whole thing is under a tenner and for a really good Christmas present that can't be bad. Click here to get yours. I will be at Dickens Of a Christmas this Sunday in Olney where I'm doing some magic at the Cowper and Newton Museum, so do pop along and see me as that's where I shall be based. 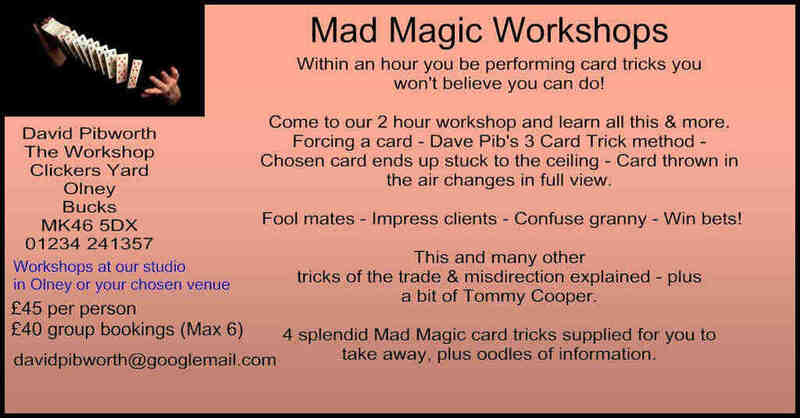 Not only do you get to see some magic, but a fine piece of Olney history, and there's always a stall where you can get some Christmas punch and much more besides. What's not to like about that? Back to the Magic And More website, if you go on the site and join the mailing list (which is easy to do, you just create an account) then you will be put into this year's Christmas draw. "You don't even have to buy anything." All names go into a hat and each month a freebie is given away. This month it is the 'Card In A Bottle' gag which costs over £30 if you were to buy it retail, so come and have a go as it costs nothing. I'm building up a good database of magic lovers. Some professional and some hobbyists, and the reason it's so popular is that if anyone ever has any questions about the magic they can always email me and I get back to them immediately which is also why our company - Magic and More - is a top seller on eBay. Sometimes an explanation of the magic is easily done on email and sometimes I phone them to chat. But my customers are very loyal as being helpful is the best selling method there is apart from great products and I test everything I sell in the magic field to make sure it is what it says it is. "I'll always brief you if a trick or gag is difficult to do as some take a lot of rehearsal, but many don't." The Magic Colouring Book is one of the most effective and easiest to do. So get those orders in and sign up for a possible Christmas gift.